Escher moment: Does it funnel IN … or OUT? But while TZ’s musical signature lasted nearly the entire length of the series, the opening credits changed fairly often. The visual elements and Serling’s narration shifted almost from week to week at times, at least during the first three seasons. 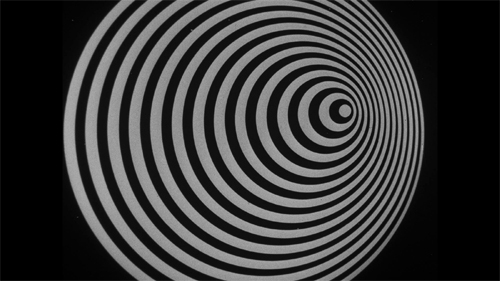 Tinkering aside, though, The Twilight Zone featured three main opening credits: the clouds-landscape-starfield montage of Season 1 (the only one with different theme music), the swirling vortex of Seasons 2 and 3, and the shattering window-eyeball-ticking clock images of Seasons 4 and 5. An ironic line, as it turns out. Grady, a horse jockey who’s been blackballed for a variety of racing infractions, is a small man who, by the episode’s end, gets his wish in the most literal way. Hello, Twilight Zone. 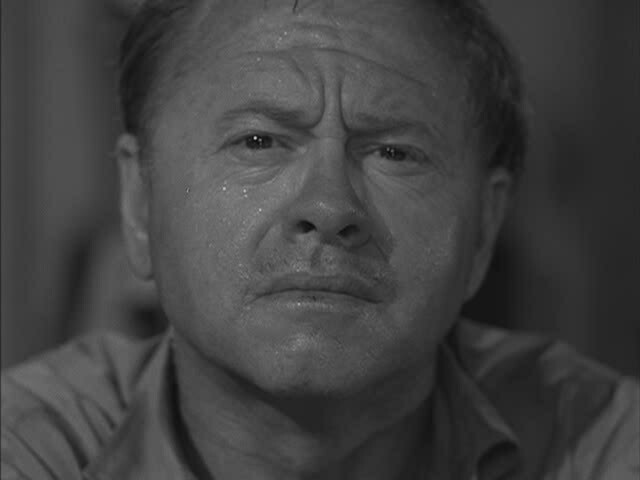 And goodbye, Mickey Rooney, the man who brought Grady to raw, sputtering life in a high-octane performance that few other actors would even attempt. He’d become big long before there was a Twilight Zone. Only five feet, two inches tall, Rooney stood considerably higher in the pantheon of golden-era film stars.